Very good. Ex-library. Dispatched daily from the UK. Tis is a fun book if you are interested in the NFL or sports in general. Reading John Grisham is a guilty pleasure of mine, like sitting down and eating a box of cookies. Yes, it may be bad for you, you may not want to admit anything to your friends the next day, but damn, those things are good! This story of washed-up NFL quarterback taking a job in the barely profession hardly solvent Italian football league is a classic fish-out-water tale. The culture shock of a not-too-bright jock in the middle of the Italian culture and culinary obsession is simply delicious. Of course it is also a story of redemption and second chances which truly is Grisham?s forte. Here, he doesn?t disappoint. Playing for Pizza is a happy romp through the griddles and gridirons of Italy. I loved this book. 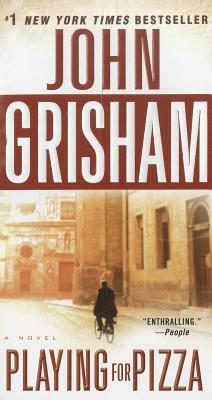 This is now my favorite John Grisham book and I have read almost all of them as he is my favorite writer. You feel like you are at every game, can taste all the food and really feel like you are in Italy as well as understand the main character and what he is going through. I really liked this book. I know very little about football, but I spent nine months in Italy and loved it. The descriptions of places and life in Italy really took me back there. That speaks volumes about the author and again I really liked this book and I know others that did too.